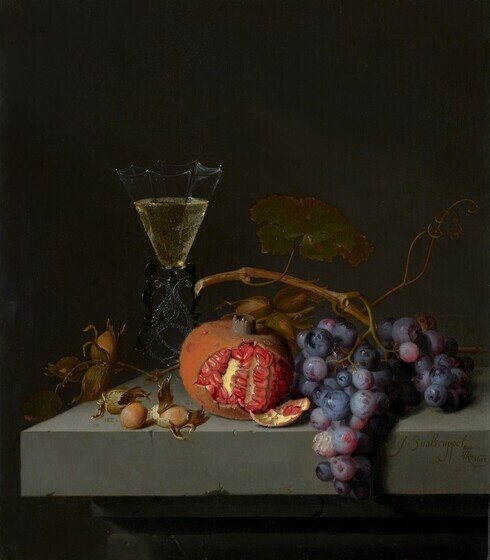 Arthur K. Wheelock Jr., “Jacob van Walscapelle/Still Life with Fruit/1675,” Dutch Paintings of the Seventeenth Century, NGA Online Editions, https://purl.org/nga/collection/artobject/119295 (accessed April 19, 2019). Though modest in size and compass, this still-life painting by Jacob van Walscapelle has a remarkable sense of grandeur. Assembling only a few objects on a plain stone ledge, the artist has conveyed a monumentality of presence usually found in much larger and more complex still lifes. Bathed in soft light, every figural element quietly asserts its essential properties. The Venetian-style glass filled with wine sparkles against the somber dark background. The pomegranate bursting with seeds invites the viewer to imagine its ripe taste, as do the grapes spilling over the edge. In addition to their simple beauty, these items are also part of a long iconographic tradition within still-life painting. The grapes and wine evoke the Eucharist, while pomegranates have complex associations with Christ’s suffering and the Resurrection. In this sense, Van Walscapelle's painting encourages the viewer to contemplate Christ's sacrifice and eventual rebirth. Though modest in size and compass, Jacob van Walscapelle’s Still Life with Fruit has a remarkable sensuality and monumentality of presence. The artist’s touch is fresh, his brushstrokes fluid, and his color sense unerring, making the image both inviting and accessible. Bathed in soft light, every figural element quietly asserts its essential properties. The elegant eight-sided façon de Venice glass filled with white wine sparkles against the dark background, as light accents its complex, delicate form. One can almost taste the ripe pomegranate bursting with red seeds, the hazelnuts, and the purple grapes that seemingly spill over the edge of the stone table into the viewer’s space. Sam Segal, A Fruitful Past: A Survey of the Fruit Still Lifes of the Northern and Southern Netherlands from Brueghel till Van Gogh (Amsterdam, 1983), 36. Van Walscapelle’s painting thus would have encouraged the viewer not only to contemplate Christ’s sacrifice and eventual rebirth but also to ponder the essence of the Christian message. Creating a harmonious composition was highly valued in the seventeenth century and reflected an artist’s ability to conceive a work with houding. See Paul Taylor, “The Concept of Houding in Dutch Art Theory,” Journal of the Warburg and Courtauld Institutes 55 (London, 1992): 210–232. Still Life with Fruit nevertheless differs from De Heem’s mature paintings in its elegant and restrained simplicity. Pieter C. Ritsema van Eck and Henrica M. Zijlstra-Zweens, Glass in the Rijksmuseum, 2 vols. (Zwolle, 1993), 1:15, note that “visitors could see glasses welche den Venedischen mit nichten weichen” or just as beautiful as the glass made in Venice. See Filips von Zesen, Beschreibung der Stadt Amsterdam (Amsterdam, 1664), 211. For a discussion of lead soaps in a painting by Jan Davidsz de Heem, see Arie Wallert and Joris Dik, “The Scientific Examination of a Seventeenth-Century Masterpiece,” Zeitschrift für Kunsttechnologie und Konservierung 21, no. 1 (2007): 38–51, and Leslie Carlyle and Maartje Witlox, “Historically Accurate Reconstructions of Artists’ Oil Painting Materials,” Tate Papers, Spring 2007 (http://www.tate.org.uk/research/tateresearch/tatepapers/07spring/carlyle.htm). (Etienne Le Roy, Brussels). William Tilden Blodgett [1823-1875], New York. (L. Souty Fils, Paris). (Julius H. Weitzner, Inc., New York). G. Huntington Hartford, II [1911-2008], New York; (sale, Parke-Bernet, New York, 12 December 1956, no. 34); (Newhouse Galleries, New York); sold to Jean McGrail, New York; by inheritance to her daughter; (sale, Sotheby's, New York, 25 January 2001, no. 219); (Berenberg Fine Art Limited, Isle of Man); purchased 11 June 2001 through (Rob Smeets, Milan) by NGA. The names of Le Roy and Blodgett are given as former owners in the catalogue of a 1938 exhibition at the Wadsworth Atheneum that included the painting. Blodgett was a businessman and varnish manufacturer as well as a collector, who became one of the founders of The Metropolitan Museum of Art in New York. Le Roy (1808-1878) was a restorer, dealer, and expert advisor to the Musée Royal de Peinture et de Sculpture in Brussels, and one of two dealers who in 1870 sold to the New York museum what became its first painting acquisitions, a purchase approved by the museum trustees the following year. It is possible that Blodgett purchased the Walscapelle painting for himself when he was in Europe for several months in 1870 negotiating on the Metropolitan's behalf. On the two men's dealings at that time see: Katharine Baetjer, "Buying Pictures for New York: The Founding Purchase of 1871," Metropolitan Museum Journal 39 (2004): 161-245. The painting did not appear in Blodgett’s estate sale on 27 April 1876, held at Chickering Hall in New York. The 2001 Sotheby's sale catalogue lists this owner. The company was a successor business to Maison Souty, well-known framemakers during the 19th century in Paris. Weitzner, whose name is given in the 1956 sale catalogue, was possibly the dealer from whom Hartford acquired the painting. Hartford was the lender of the painting to the 1938 exhibition at the Wadsworth Atheneum. He was an heir to the A&P supermarket fortune, and owned an extensive art collection. The information about Newhouse's purchase and sale of the painting is provided by Meg Newhouse Kirkpatrick, of Newhouse Galleries, in her letter of 17 September 2001 to Arthur K. Wheelock, Jr., in NGA curatorial files. The 2001 Sotheby's sale catalogue indicates that Newhouse owned the painting with the dealer Frederick Mont, and the 1969 and 1980 references to the painting associate it with Mont, but the Newhouse records do not reveal any information about Mont's ownership. Probably Exposition de tableaux et dessins d'anciens maîtres, La société néerlandaise de bienfaisance, Brussels, 1873, no. 339 (supplement of the catalogue's second edition). The Painters of Still Life, Wadsworth Atheneum, Hartford, 1938, no. 24, as The Pomegranate. The painting was executed on a panel made from a single board of oak with a vertical grain. The back of the panel is beveled along all four edges. The ground is rather thin and does not fully obscure the heavy wood grain. It appears white through most of the cracks and losses, but under the fruit it looks gray. The gray color may indicate an underpainting, or Walscapelle could have painted the gray stone ledge without leaving reserves for the fruit. The paint was applied mostly wet-into-wet, but details and highlights were applied wet-over-dry. Impasto is located only in the brightest highlights. The painting is in excellent condition. Tiny pitting is visible in the paint, especially in the wine. This may have been caused by lead soap aggregation. A few small, flake losses are located in the paint of the pomegranate. Inpainting is found along the front edge of the stone table, and along the right edge of the glass of wine. Under ultraviolet light, remnants of an earlier varnish can be seen along the top and left edges and in the wine glass. Steve Wilcox, head of frame conservation at the National Gallery of Art, characterized the wood based on visual examination of the panel and the X-radiographs. Decamps, Louis. "Correspondance". Gazette des Beaux-Arts 8 (September 1873): 278 (probably the NGA painting). Société Néerlandaise de Bienfaisance. Exposition de tableaux et dessins d'anciens maîtres. 2nd ed. Exh. cat. Société Néerlandaise de Bienfaisance, Brussels, 1873: probably no. 339 (catalogue supplement). Wadsworth Atheneum. The Painters of Still Life. Exh. cat. Wadsworth Atheneum. Hartford, 1938: no. 24. Bol, Laurens J. Holländische Maler des 17. Jahrhunderts nahe den grossen Meistern Landschaften und Stilleben. Braunschweig, 1969: 377 n. 488. Vroom, Nicolaas R. A. A Modest Messageas Intimated by the Painters of the "Monochrome Banketje." 2 vols. Schiedam, 1980: 2:317. Sam Segal, A Fruitful Past: A Survey of the Fruit Still Lifes of the Northern and Southern Netherlands from Brueghel till Van Gogh (Amsterdam, 1983), 36. Creating a harmonious composition was highly valued in the seventeenth century and reflected an artist’s ability to conceive a work with houding. See Paul Taylor, “The Concept of Houding in Dutch Art Theory,” Journal of the Warburg and Courtauld Institutes 55 (London, 1992): 210–232. The identical glass and a similar bunch of grapes appear, for example, in a tabletop still life (oil on canvas, 49 x 41.5 cm) in Silvano Lodi, Ausstellung Alter Meister (Munich, 1969), no. 4.